The witching hour is almost upon us and there’s plenty of family friendly activities across Tipperary to keep little ones entertained over the mid term break. From 25th October to Wednesday 31st the town of Thurles will once again be transformed into a ghoulish playground for the annual Halloween festival. A host of workshops including pumpkin carving and painting, arts and crafts classes and face painting will delight children of all ages while older kids will get a real kick out of a Special FX Makeup class at the Bookworm Thurles. There are a host of music events throughout the week long event including appearances by Strings and Things, Mick Hanly and Paul Brady while comedy fans are in for a treat when funnyman Pat Shortt drops by for two nights to The Source on Oct 27 and 28. Thurles Rugby Club is the place to be on Wednesday 31st for a magical fireworks display at 9pm. Food and craft stalls will flank the grounds from 6pm beside the fun fair and carnival. 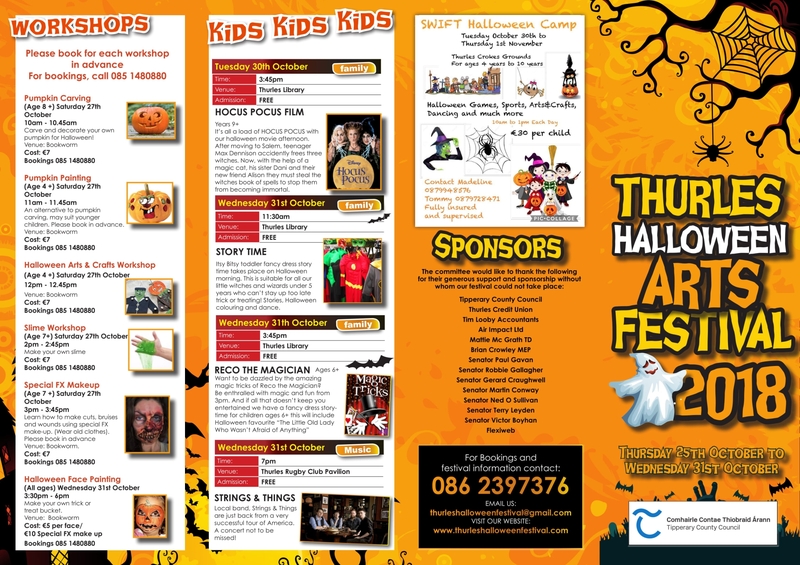 For full listing of events check out thurleshalloweenfestival.com. Elsewhere in the town magic spells abound at Thurles Library when Reco the Magician descends on The Source on Wednesday 31st October at 3pm. Earlier that morning little ones can parade their most ghoulish ensembles at the toddler fancy dress storytime event at 11.30am. The much loved Disney flick Hocus Pocus will also be sure to draw a crowd on Tuesday 30th October at 3.45pm. Spaces for these events are limited to book early on 0761-06-6131 to avoid disappointment. 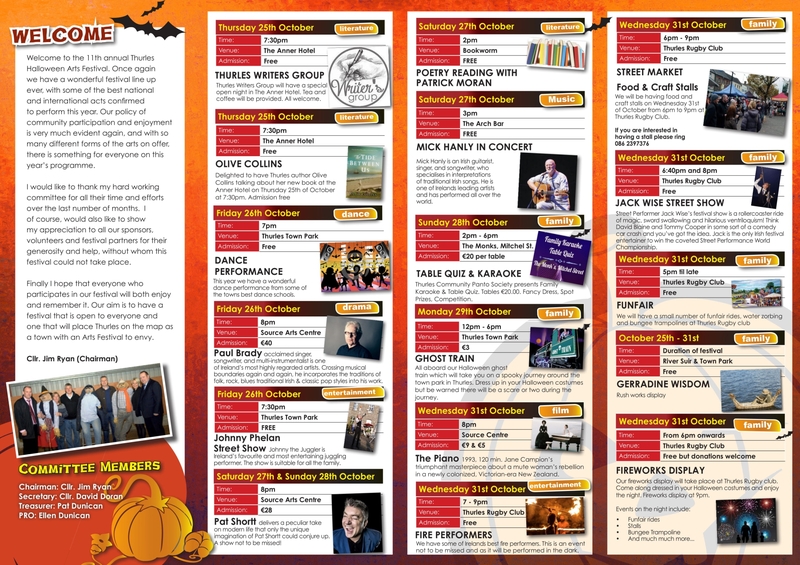 Cashel Library is the place to be for ghouls and goblins alike this week with writing seminars, traditional Halloween games and film screenings set to entertain all ages. 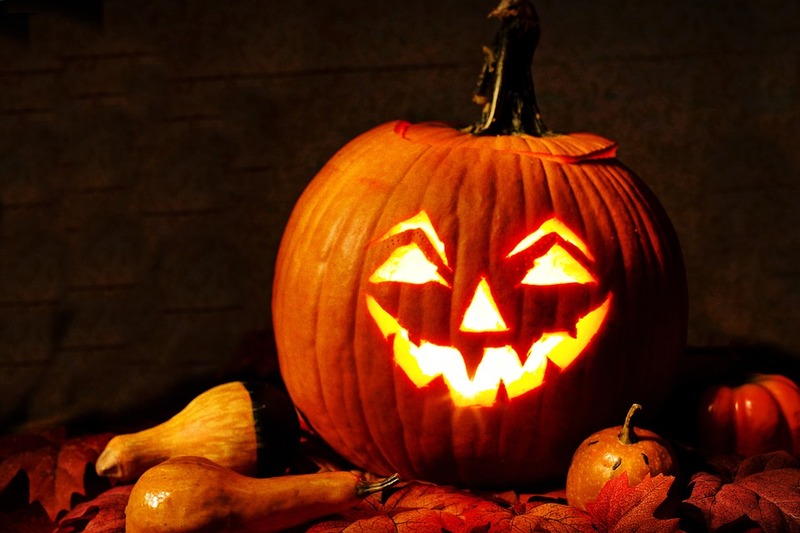 A Scary Story writing workshop (10-12 years, 3.30pm to 5pm) takes place on Wednesday 24th October, a Halloween craft workshop on Tuesday 30th October (ages 8-12 years, start time 3pm) and Traditional Halloween Games (ages 8-12 years) on Wednesday October 31st from 11am. All attendees are invited to wear their scariest outfits. On Wednesday 31st October there will be a storytime event for little ghosts at 3.30pm (suitable for ages 3-7 years) while on Thursday November 1st the library will screen the spooktacular film Goosebumps at 2.30pm. All events are free however spaces are limited. To book your place contact Cashel Library on 062 63825. Nenagh is the place for be for a host of Halloween fun this October as the annual Spleodar Festival kicks off from October 27th-31st. Tobi Omoteso, who got through to the live shows of the dance series on Sky One ‘Got to Dance’, will lead a Hip-Hop, Freestyle and B-Boying workshop for ages 13 plus that will focus on techniques, history, musicality, creativity, battle technique and agility, all of course while having lots of fun. On Sunday, Dowtcha Puppets present Punch and Judy with that scoundrel Mr Punch still up to his wicked lazy ways, dodging his share of the baby minding and chores and tricking everyone who comes to try and sort him out. One all the family will truly enjoy. Young and old alike will delight in a Puppet Workshop giving children the chance to make their favourite Halloween characters. Limerick Printmakers return to Spleodar this year bringing two new printmaking workshops, Monotype Printing for 4-9 year old's and Drypoint printmaking for children ages 10 plus. Both workshops are ideal for curious young minds who love to try new things and learn new skills all while exercising their vivid imaginations. On Monday evening, join in the Spooktacular Carnival Parade along with Samba Drummers, The Musical Theatre Academy and the Nenagh Brass Band starting at the Franciscan Friary for what promises to be a celebration of all things ghoulish. 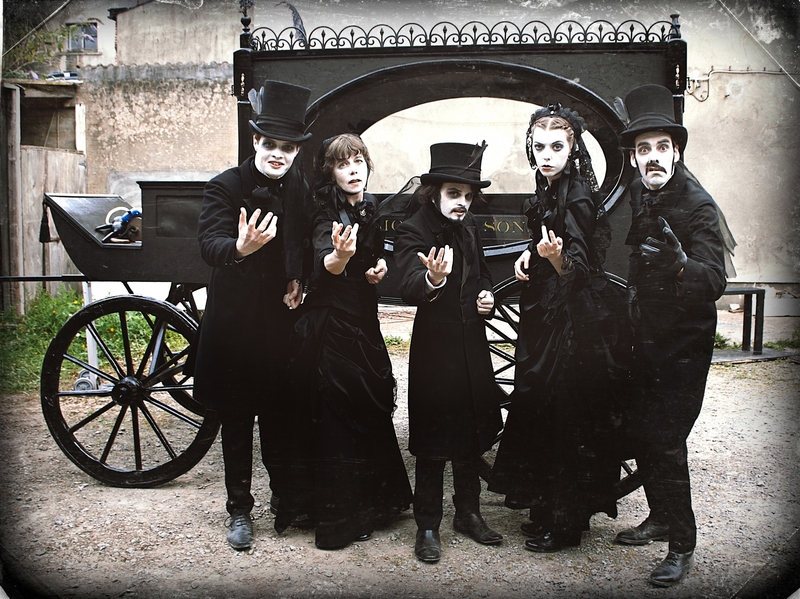 Follow undertakers Morbid & Sons through the streets of Nenagh with their ornate Victorian hearse to the Arts Centre to experience their interactive, macabre show about death and the afterlife. Be warned though, they might choose you to avail of their “buy now, die later” offer. The fireworks display will bring to a close this year’s five day Spleodar Halloween Arts Festival. Commencing at 7pm on Wednesday 31st October at the CBS Sports Field, the entry charge is €2 per person or €5 for a family of four (which can be paid at the gate). You can find details of times for all shows and events at here or by phoning us at (067) 34400. Don’t forget to come dressed up in your Halloween costume and make sure the family are suitably gruesome too.